…… it was a long time ago, back when I was just Jane and I hadn’t quite invented Fleur. I had a book token, I wanted buy something I wouldn’t normally but for myself – or at least something that I would have thought twice about. I spotted a large hardback book that looked so very promising. I didn’t know the title or the author, but I knew that I had to bring the book home. And so I did. 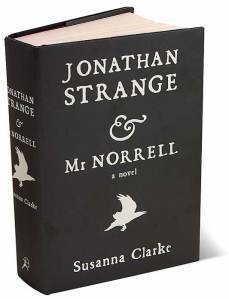 That book was ‘Jonathan Strange and Mr Norrell’ by Susanna Clarke. Since then I’ve started it so many times but never finished it. It wasn’t that I didn’t love it, but because I did; because it was a special book to be saved up. Vishy, from Vishy’s Blog, and Delia, from Postcards from Asia, which starts on the 11th January! I’m thinking of it not as one big book, but as a drama in three acts. And other reading may have to wait, because this is the story that is calling me now ….. I love this book! I love her short story collection The Ladies of Grace Adieu and Other Stories, too. I actually read them first and fell in love with her writing that way. Enjoy the read-a-long! I’ve had this on my list for a long time, too. Sounds like good motivation to get through it! I’ve never read this (like you, I’ve started but never finished it) – I’ll be interested to read your final verdict! Good luck! I think I have heard that a TV adaptation of this book is coming up some time this year. Hello Jane, I wish you all the best with this one. I too bought this one a few years ago, started it, thought it special, rich and fascinating, and then abandoned it for some reason! She is a great writer, writes like a Victorian, which I like, but it’s just one of those big tomes that sometimes are hard to get through unless you really devote some time to it. Mine is sitting there on a shelf, looking impressive and pristine, awaiting my attention again one day! Glad to know that you will be joining us for the readalong, Fleur. Enjoyed reading your post and your story of how you discovered the book. Happy reading! Looking forward to reading your first post on it. Although I currently seem to be allergic to chunksters mostly, I would love to re-read this book (yes, I read it and loved it when it first came out). Loved this but I vaguely remember being slightly irritated by copious footnotes. I read this soon after it first came out and I remember loving the combination of history and fantasy. I hope you enjoy the readalong! This has been sitting on my shelf for years and years. I don’t know if I’ll ever read it, but I don’t want to part with it for some reason. Maybe I just know that one day it will be time to read it. I can’t wait to hear what you think! I love this book. Looking forward to hearing what you make of it. I read this book pre-blogging. It took me 6 months and although it was slow and tedious in places I ended up loving it. I hope you do too – good luck! Its a brilliant book. Look forward to you posting your thoughts. Wonder if Susanna Clarke will write anything else? I’d buy it! Good luck, Fleur. I hope you enjoy the book. I’m also participating in the read-along, and I’m looking forward to your reviews. I read this book about 5 years ago – remember it being a bit chunky for me in places and a bit hard to get through for those sections. But overall the story does carry it along and it was an interesting read.